We really had to check official match report to make sure if this disproportion, reported by USA Today, was true. And it was indeed. Yesterday the newly-transplanted (from San Diego to Los Angeles) Chargers were facing Arizona Cardinals at the modest StubHub Center in Carson. The official report gives 25,343 as official paid attendance but then we watched the game online to confirm that this was nowhere the case. In fact, the stadium was barely half-full, with some sections of the auditorium almost deserted. This of course is part of the everlasting debate: why give number of tickets bought rather than number of people actually in attendance? But for Chargers there's one more issue. 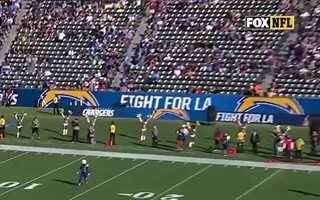 They're playing their first season in Los Angeles since abandoning San Diego and StubHub Center sees large numbers of empty seats every time, despite being 2.5 times smaller than their future home in Hollywood Park. L.A. has long been advertised as USA's largest available NFL market and second largest of all cities. Yet it seems there's little interest in actual Chargers games, despite tickets reportedly being resold for puny $9. There's a lot work to be done before moving to a 70,000+ stadium in 2020.